Sarkar (lit. Government) is a 2018 Indian Tamil-language action drama film written and directed by AR Murugadoss, and produced by Kalanithi Maran under the banner Sun Pictures. The dialogues were co-written by Murugadoss and B. Jeyamohan. The film stars Vijay, Keerthy Suresh, Varalaxmi Sarathkumar, Yogi Babu and Radha Ravi. It follows Sundar Ramaswamy, a non-resident Indian (NRI) who arrives in India from the United States to cast his vote in the election, only to find his vote has already been recorded as cast. Ramaswamy raises awareness against electoral fraud among the masses, and decides to contest as a nonpartisian politician in the elections amidst several attempts made on his life and reputation. Principal photography for Sarkar began in January 2018. Murugadoss collabrated with Vijay for a third time with Sarkar, which was the latter's 62nd film and given the tentative title of Thalapathy 62. In early December 2017, Sun Pictures agreed to produce the film. While Girish Gangadharan handled the cinematography, A. Sreekar Prasad served as the editor. In August, few scenes were shot at Las Vegas. Filming was completed by September 2018. The film's soundtrack, composed by A. R. Rahman with lyrics written by Vivek, received positive reviews. After various complications, including protests and allegations of plagiarism, Sarkar was released on 6 November 2018, during the week of Diwali. It received mixed reviews; while Vijay's performance, concept and cinematography was praised, both the screenplay and sequences were criticised. Post-release, the film involved in controversies with reference to Jayalalithaa in the film's audio track and other sequences from the film led to protests by members of the All India Anna Dravida Munnetra Kazhagam. After lawsuits were registered against the makers, the said allusions were muted. Sarkar has grossed ₹260 crore (US$40 million) worldwide, and has emerged as a commercial success. Sarkar is the highest grossing south Indian film of 2018, overtaking Bollywood and Telugu hits like Gold, Raazi and Rangasthalam. Sarkar collected US$1 million at the U.S box office after Theri and Mersal. As a result of the film's success, the Election Commission of India created awareness regarding Section 49P of the Conduct of Elections Rules, 1961 that allows a voter to have the right to get back his/her ballot back and vote if someone else voted in that individual's name. Sundar Ramaswamy is a highly successful non-resident Indian businessman based in the United States, referred to as a "corporate monster" due to his ruthless business dealings. He arrives in Chennai to cast his vote in the Tamil Nadu Legislative Assembly election. However, he finds out that someone else had already voted in his name. Sundar approaches the Tamil Nadu State Election Commission and demands a stay on the election result for his constituency, an annulment of the fraud elector's vote and the ability to legitimately cast his vote, to which they agree. Sundar raises awareness among the public regarding fraud voting and finds that many people too faced a similar problem to his when trying to vote. Meanwhile, Sundar rekindles his romance with his estranged sister-in-law's sister Nila, whom he had last met five years ago. His actions bring him into conflict with two influential and corrupt politicians, M. Masilamani, who is the Chief Minister of Tamil Nadu, and his brother Malarvannan "Rendu". Although Masilamani's party wins the elections, the Election Commission annuls the result based on Sundar's plea and fresh elections are scheduled to take place within the next fifteen days. After attempts are made on his life by Rendu's henchmen, Sundar decides to contest the election against Masilamani as an Independent and resigns from his company to avoid any conflict-of-interest. Initially unpopular among the masses due to his corporate background, Sundar delivers a speech detailing his rise from a humble fisherman background to a businessman, and gains popular support. He and his supporters gatecrash an event involving the merger of Masilamani's party with the opposition. After Sundar confronts Masilamani regarding his silence on district-related issues, the police brutally beat up Sundar and his supporters. At this juncture, he realises that the entire political system in the state and country needs reform, and decides to contest in all constituencies in Tamil Nadu along with his supporters. Sundar acquires video evidence wherein people who had attempted to expose Masilamani's corruption were killed under mysterious circumstances, and plans to reveal it to the media to discredit Masilamani and have him arrested. Meanwhile, Masilamani's daughter Komalavalli "Pappa", based in Canada, arrives in Chennai after finding out that her father and uncle have lost support due to Sundar. She decides to spoil Sundar's reputation and frame him as a corrupt and power-hungry person. She orchestrates a car accident and frames Sundar for it, which causes him to lose considerable public support. She furthers her agenda by killing her father with an overdose of diabetic tablets, so that her party will gain sympathy votes. These crimes ensure that Pappa, the new Chief Ministerial candidate for her party, would likely win the election. Sundar decides against exposing the evidence against Masilamani as he feels that his support will further erode, which was what Pappa intended to accomplish. On Election Day, Twitter messages generated from one "Muthukumar" allege Sundar has stashed black money in various locations, which further degrades Sundar's reputation. However, unknown to anyone, the tweets were sent by Sundar himself, as Muthukumar was one of those activists killed by Masilamani. Further messages lead to Muthukumar's decomposed body being found, exposing Pappa's lies. Meanwhile, Pappa finds out that her mother has decided to expose Pappa's role in Masilamani's death at the latter's memorial in front of the media later in the day. She arrives at the memorial with her henchmen to stop the expose, but Sundar subdues Pappa's henchmen and her mother's confession is live-streamed, which ensures that the public support is back with Sundar. Sundar and his supporters win the election, while Pappa and Rendu are arrested for their various crimes. However, Sundar decides against becoming the Chief Minister, and instead chooses one of his supporters, an honest collector, to be the next Chief Minister. Real-life activists such as Kalki Subramaniam, Piyush Manush and Narayanan Krishnan made cameo appearance as themselves in the song "Oru Viral Puratchi". Following the successful ventures, Thuppakki and Kaththi, AR Murugadoss was confirmed to be the director of the 62nd film of actor Vijay. The project, tentatively titled Thalapathy 62 (the working title as it is the 62nd film starring Vijay, who is known as Thalapathy among fans), was slated to enter production once Vijay completed Mersal and Murugadoss completed Spyder. In early-December 2017, T. Santhanam was confirmed as the art director of the film, and following this, it was made official that Sun Pictures was producing the film. Girish Gangadharan was chosen in as the cinematographer. A. R. Rahman was also rumoured to be in talks to compose the music of the film. Sreekar Prasad, who had previously edited Thuppakki and Kaththi was the film's editor. Jeyamohan was recruited as writer, and shooting began in January 2018.The title Sarkar was revealed on 21 June 2018 ahead of Vijay's birthday,. Tulasi played the role of Sundar's mother in the film. In mid-November 2017, it was reported that actor Yogi Babu was in talks to play a role in the film and actress Nayanthara was in talks to be the female lead. Jaswanth Khanna, son of comedian Ramesh Khanna, who had worked as an assistant director, made his acting debut with this film. Keerthy Suresh was later signed to play the female lead role and Varalaxmi Sarathkumar was also confirmed, playing a pivotal role. Principal photography began in January 2018. The team had successfully completed the first and second schedules of the shoot, and begin their third schedule in Las Vegas in early August. Shooting was wrapped up on 5 September, after which dubbing and post production works were carried out. The music and score of the film is composed by A. R. Rahman, and lyricist Vivek penning the songs. The full audio album was launched on 2 October 2018 at Sai Leo Muthu Auditorium, Sri Sai Ram Engineering College, Chennai. The album consist of five songs, all penned by lyricist Vivek. The team launched the very first single "Simtaangaran", which received mixed reviews, on 24 September, followed by "Oru Viral Puratchi" on the last day of the same month of September which too received positive reviews. The album in its entirety was made available for download in digital on 2 October. The promotional music event featured dance performances for the songs in the background. The soundtrack album was released and bagged under the Sony Music record label after few days the single track is released. Sarkar is Rahman's fourth collaboration with actor Vijay, after Udhaya, Azhagiya Tamil Magan and Mersal. The audio release event of the film was conducted in a much peculiar way, where for the very first time the audience were given the privilege of launching the music album online by the means of the production company's website. The audio launch event held a live telecast aired on Sun TV and on their exclusive paid service called SunNXT . Significant crew members took turns in giving an opinion of their experience being part of the project. Celebrities such as director Atlee turned up that night, as guests. Unlike other music events, Rahman opted not to perform. Instead trained dancers put a rendition for the beats of his. It transpired that the album was unofficially leaked without the team's consent, ruining the hype built up for album. In essence, the soundtrack was very well received by the public, the general consensus was positive. Indiaglitz gave a 4 out of 5 star rating, but cited: "Sarkar though rich in techno and electronic treatment, finds a winning combo with its amazing lyrics". Studioflicks mentioned "A mix of local and western flavour from A. R. Rahman", giving it a rating of 3.25 out of 5. Behindwoods gave it 2.75 out of 5 stars and stated: "A. R. Rahman goes full-on techno for Sarkar ". All tracks written by Vivek. All tracks written by Rakendu Mouli, Vanamali, and Chandrabose. Sarkar was released on 6 November 2018, during the week of Diwali. The film released in an unprecedented way for a Tamil Film by releasing on Tuesday. The film opened in 3400 screens worldwide. Additionally the film released to the Tamil speaking Indian Diaspora in 80 countries with 1200 international screens. The film’s overseas distributors have ensured that the film releases in as many as new markets such as Poland, Mexico, Philippines, New Zealand, Ukraine, Russia, and several countries in the African continent. The Kerala fans of the actor erected a 175 feet tall cut-out of the actor, the tallest cut-out for a film actor in Kollam. The film released on diwali and according to the trade trackers it earned across Rs. 30 crore in Tamil Nadu on its opening day, beating Baahubali 2. Sarkar has broken several collection records, including the one held by 'Sanju' for Overall collections and joined the 100 Crore Club within two days. Sarkar earnings in France was more than 20,000 admissions as of 15 November 2018. In Malaysia, the film earned US$1,793,542 (₹13.03 crore) from the six-day opening weekend. The film received mixed reviews from critics, with praise for Vijay's screen presence and performance, however, the screenplay and sequences were criticised. Anusha Iyengar of Times Now gave the film a 3.5 out of 5 rating and said, "Vijay’s performance is far better and mature than any of his other performances. Jeyamohan, the writer of the film, deserves all the credit here for writing dialogues that only Vijay can pull off with that kind of impact and power". Sakshi Post gave the film a 3.5 out of 5 rating saying, " Sarkar has all the makings of a commercial thriller. You will see Vijay's signature dialogues which are whistle worthy and scenes with Murugadoss trademark. The film contains all the ingredients of a masala entertainer and keeps you engaged through the movie. Vijay's role is powerful and leaves a mark, BGMs provide the perfect accompaniment while action scenes stand out. Keerthy and Varalaxmi deliver". Times of India gave the movie a 3 out of 5 rating cited that Vijay carried the film in a smart, lengthy film that has a good message but lacks strong antagonists. News18 was more critical of film and gave it a 1.5 out of 5 rating and said that the "Vijay's Film is the Glorification of a Politically Aspiring Actor. " While Sarkar cannot be faulted in direction or mounting with some great action sequences, the plot has been written only for Vijay. There is really no place for a second character. Even Keerthi Suresh, who was excellent as the South Indian actress Savithri in the biopic, Mahanati, is reduced to essaying a wide-eyed admirer of Ramaswamy. Others like Radha Ravi have also been relegated to the background. ". Following release, the Tamil Nadu government accused the film-makers and Vijay that they are inciting the people by targeting the ruling government in some scenes and defaming former chief minister J Jayalalitha by naming the main antagonist with her alleged original name Komalavalli. [a] This led to numerous protests by AIADMK party cadre at theatres where the film is screened and vandalism of the banners of Vijay. AIADMK accused Sun Pictures which is owned by Kalanidhi Maran, who is the grand nephew of former Chief Minister Late M Karunanidhi of DMK of targeting the government. Several actors such as Rajnikanth, Kamal hassan supported the film-makers by raising the voice against the oppresion of freedom of speech. They cited that a film must not be scrutinized even after the censor of the film by CBFC India  Following the threat of lawsuits from the government, the film-makers accepted to cut the scenes and mute references of Komalavalli in the audio track. Writer Varun Rajendran accused Murugadoss of plagiarising Sengol, a story he had registered with the South Indian Film Writer's Association in 2007. After K. Bhagyaraj, the head of the Association concluded that Sarkar's script was not original, the matter was taken to court, where the judge directed both the parties to come up with an agreement for the scheduled release of the film. In the resulting agreement, the director admitted that the story of Sarkar was the same as of Sengol and Sun Pictures have agreed to thank Varun Rajendran and flash a message card for 30 seconds after the thank you note in the title card and also pay him ₹30 lakh (US$42,000) as compensation. As a result of the film's success, the Election Commission of India created awareness regarding Section 49P of the Conduct of Elections Rules, 1961 that allows a voter to have the right to get back his/her ballot back and vote if someone else voted in that individual's name. ^ T. T. V. Dhinakaran stated that “Komalavalli (the character’s name) is not Amma’s name at all. In 2002-03 when a Congressman referred to her by this name, Amma herself said this was not her name and that she had not even done any such film role,” in the context of a controversy over of the use of the name in the Tamil film Sarkar. Jayalalithaa objected to the use of the name Komalavalli in a biography and obtained a stay . Her niece Deepa Jayakumar also denied Komalavalli was Jayalalithaa's birth name. ^ "Sarkar Running Time". 12 November 2018. Retrieved 12 November 2018. ^ a b "அடேங்கப்பா, பாக்ஸ் ஆபிஸ் வசூல் இவ்வளவா? மெர்சல் சாதனையை முறியடித்த 'சர்கார்'!". Samayam Tamil (in Tamil). 2018-11-24. Retrieved 2019-02-12. ^ "SARKAR". British Board of Film Classification. ^ "Here's the summary and run time of Thalapathy Vijay's Sarkar". India Today. ^ "Sarkar Audience Review - Fans all praise for Thalapathy Vijay's action drama". Times Now. ^ HT Correspondent (15 November 2018). "Vijay's Sarkar is the highest grossing south Indian film of 2018, overtakes Gold, Raazi, Rangasthalam". Hindustan Times. Retrieved 22 February 2019. ^ Prakash Upadhyaya (21 November 2018). "Sarkar box office collection: Vijay and Murugadoss' film enters $1 million club in US". International Business Times. Retrieved 22 February 2019. ^ "Vijay 62 directed by AR Muragadoss will not be produced by Lyca Productions". Indianexpress.com. 17 May 2017. ^ "Sun Pictures to produce Thalapathy 62?". Sify.com. ^ "Shooting update of Vijay's Sarkar". Behindwoods.com. 17 July 2018. ^ "Girish Gangadharan will be the cinematographer of Vijay's next Thalapathy 62". Behindwoods.com. 25 October 2017. ^ "விஜய்யின் 62வது படம்- படப்பிடிப்பு எப்போது, இசையமைப்பாளர் யார்?". Cineulagam.com. ^ "Sreekar Prasad roped in for Thalapathy 62". Behindwoods.com. 27 November 2017. ^ Upadhyaya, Prakash. "Thalapathy 62 title: Sarkar is the name of Vijay's next movie with Murugadoss [First look poster]". International Business Times, India Edition. Retrieved 21 June 2018. ^ "When Thalapathy Vijay treated reel mother as real mother". indiaglitz.com. ^ "Vijay and Nayanthara For Vijay 62? - AR Murugadoss – TamilTwist". Tamiltwist.us. 16 November 2017. ^ "Yogi Babu in talks to act in Thalapathy 62". Behindwoods.com. 25 November 2017. ^ "Ramesh Khanna's son Jashwanth Kannan acting in Vijay's Sarkar". Behindwoods.com. 20 October 2018. Retrieved 13 November 2018. ^ "'Sarkar': Varalaxmi Sarathkumar plays CM's daughter in Vijay's film?". The Times of India. ^ "'Sarkar': Varalaxmi Sarathkumar has her fan-moment with Vijay". The Times of India. ^ a b "Vijay's next kickstarts". The New Indian Express. 19 January 2018. Retrieved 21 January 2018. ^ "Writer Jeyamohan on board for Thalapathy 62". Sify. 21 January 2018. Retrieved 21 January 2018. ^ "varu sarathkumar on Twitter". Twitter. ^ "Vivek to pen all the songs for AR Rahman in 'Sarkar'". Sify. Retrieved 26 July 2018. ^ "'Sarkar' Audio Launch on 2 October" (24 August 2018). Retrieved 11 September 2018. 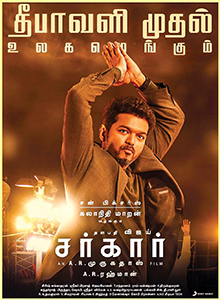 ^ "Sarkar Music review songs lyrics – IndiaGlitz.com". IndiaGlitz.com. Retrieved 7 October 2018. ^ "Sarkar Music Review | Sarkar Songs Review | Studio Flicks". StudioFlicks. 2 October 2018. Retrieved 7 October 2018. ^ "Sarkar Music Review Summary | Sarkar Music Review". Behindwoods. Retrieved 7 October 2018. ^ "Sarkar first single: Here is the song-release date of Vijay, Keerthy Suresh's film". 27 August 2018. Retrieved 28 August 2018. ^ "Sarkar release on Diwali 2018: Vijay film gets 3400 screens worldwide". India Today. Retrieved 2018-11-22. ^ "Vijay's Sarkar eyes blockbuster opening with massive advance booking, shows in 3000 screens across India- Entertainment News, Firstpost". Firstpost. Retrieved 2018-11-22. ^ "Vijay's 'Sarkar' to release in 80 countries, 1200 international screens". The News Minute. 2018-10-31. Retrieved 2018-11-22. ^ "Kerala fans of Vijay erect 175-ft cut-out of the actor, the tallest in the country". The News Minute. 2018-11-03. Retrieved 2018-11-22. ^ "Vijay's Sarkar Gets a Bigger Opening Than Baahubali 2 in Tamil Nadu". News18. Retrieved 2018-11-22. ^ "Vijay's 'Sarkar' joins Rs 100 crore club in just two days". The News Minute. 2018-11-08. Retrieved 2018-11-22. ^ "Sarkar earnings in France". ^ "Sarkar movie review and release highlights: Vijay starrer opens to mixed reviews". Indianexpress.com. 7 November 2018. Retrieved 13 November 2018. ^ "Sarkar movie review: Thalapathy Vijay's swag and performance in the AR Murugadoss film screams blockbuster | South News". Retrieved 2018-11-30. ^ "Sarkar Movie Review: Vijay Delivers Diwali Cracker". Sakshipost. Retrieved 2018-11-30. ^ "Sarkar Movie Review: Vijay's Film is the Glorification of a Politically Aspiring Actor". News18. Retrieved 2018-11-22. ^ "AIADMK protests against reference to Jayalalithaa in Vijay starrer 'Sarkar'". Hindustan Times. 8 November 2008. ^ "'Sarkar' vs Tamil Nadu govt: Court grants AR Murugadoss protection, he cuts three scenes". The Indian Express. 10 November 2018. ^ "ஜெயலலிதாவின் பெயர் கோமளவள்ளி இல்லை- ஜெ.தீபா பேட்டி". tamil Samayam. 10 November 2018. ^ "Vijay's Sarkar faces backlash from ruling AIADMK, party says film could incite violence". The Indian Express. 8 November 2018. Retrieved 9 November 2018. ^ "Vijay and Maran's 'Sarkar': What AIADMK's objection to the movie is all about". The News Minute. 8 November 2018. Retrieved 9 November 2018. ^ "Sarkar controversy: Police arrives at AR Murugadoss' house; Rajinikanth, Kamal Haasan support film amid AIADMK backlash- Entertainment News, Firstpost". Firstpost. Retrieved 2018-11-22. ^ "Tamil Film's Makers Give In To AIADMK 'Sarkar', Make 4 Cuts". NDTV.com. Retrieved 9 November 2018. ^ "Plagiarism charges against AR Murugadoss once again – The News Minute". The News Minute. Retrieved 21 October 2018. ^ "'Sarkar' plagarism row: Director AR Murugadoss to flash message card agreeing that theme is similar". The New Indian Express. 30 October 2018. Retrieved 30 October 2018. ^ "LIST OF WINNERS FOR BGM ICONIC EDITION". ^ "Vijay's 'Sarkar' impact: Election Commission of India creates awareness about section 49P". The New Indian Express.